The research group "Augmented Reality Acoustics" aims to measure and visualize the sound radiation of objects and the spatial propagation of sound waves. 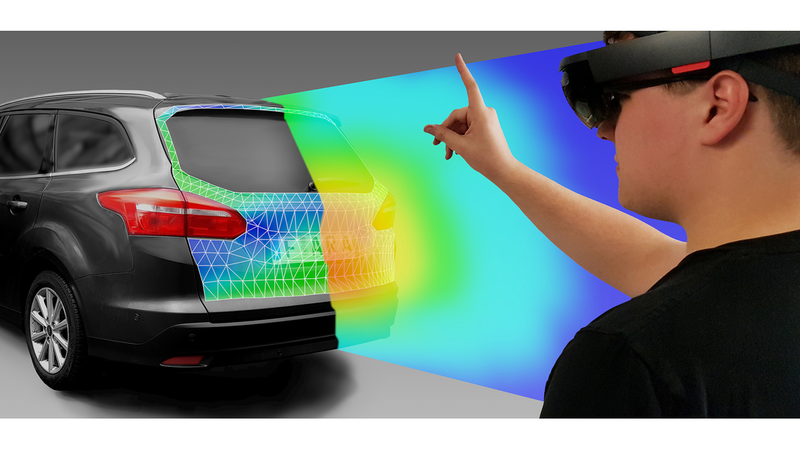 In addition to airborne and structure-borne sound sensors, innovative augmented reality applications are used to determine the positions of sensors and for visualization. In many acoustic tests, for example the measurement of sound power, microphones or sound intensity probes need to be placed at numerous precisely defined locations around the sound source. Their accurate positioning is often challenging and tedious. In practice, this is either solved by complex auxiliary structures or left to the judgement of the user. Augmented reality offers an innovative solution. Instead of using physical structures, virtual guides can be used that are only visible to the operator through a head mounted display. This improves the efficiency and the quality of the results by eliminating auxiliary field-affecting structures. The hand-held probe is tracked by the headset to give the user feedback about the current position and orientation. Standard sound power measurements can be performed with a single probe or microphone without additional auxiliary structures. The visualization of measurement results is also possible in the virtual environment. The enveloping surface is coloured based on the interpolated measurement results and can displayed immediately after the measurement as a visible overlay of the measured values on the object. This allows sound sources to be located intuitively as well as the sound flow to be views in the context of the real environment. Using augmented reality, the user instantly receives information about intensity or sound pressure levels on the enveloping surface and the total sound power from the area integral.